Jeff For Banks: Where will banks get their next dollar of capital? Where will banks get their next dollar of capital? I make a living helping financial institutions be as profitable as feasible. Why? To perpetuate their business model. This is how I feed my family. But profits have been under pressure since 2008. First, FIs experienced pressure in their investment portfolios, purchasing Fannie Mae preferred's and other FIs trust preferred securities. Next, our over-exposure to construction and land development loans came to roost. Then commercial real estate fell under pressure as the economy teetered and rent roles declined. Many banks had to replenish lost capital. The government stepped in to help, and taught us to ignore the guy/gal that knocks on our door and says "I'm from the government, I'm here to help." 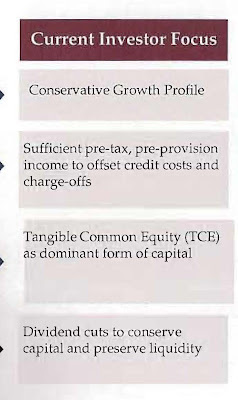 Absent or in concurrence with government-injected capital, FIs sought fresh capital. But retail investors were nowhere to be found. This was one of the points made by Lisa Schultz of Stifel, Nicolaus, Weisel, an investment banking firm that specializes in FIs, at a recent Pennsylvania bankers conference. Ms Schultz said retail investors were absent for all industries, not just FIs. She opined that they opt instead to invest in mutual funds, hedge funds, etc. Therefore, all of the action to attract capital was in the institutional market. 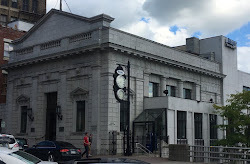 I made this point in a past blog post, opining that the change in our shareholder base would be a significant factor driving future bank consolidation. 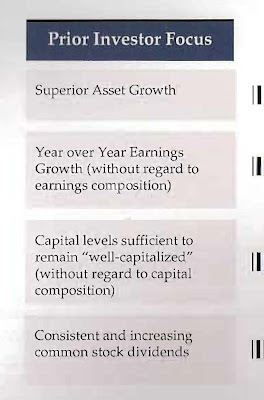 The change in shareholder focus, as presented by Ms. Schultz, is represented in the tables below. But this changing focus is from the institutional shareholder perspective... not the retail investor. The future investor will be concerned with quality growth that enhances shareholder value, combined with dividend policies that are mindful of capital preservation. 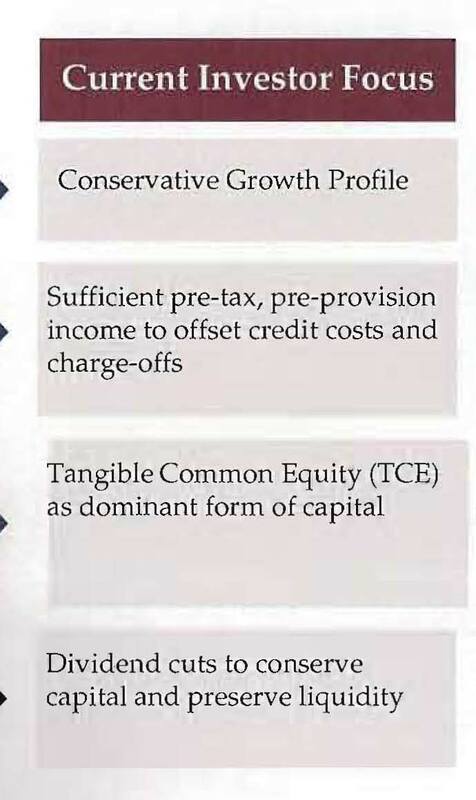 I'm not sure how an FI will meet the 20%-30% capital appreciation, combined with sufficient liquidity, to meet "future", i.e. institutional, investor demand. 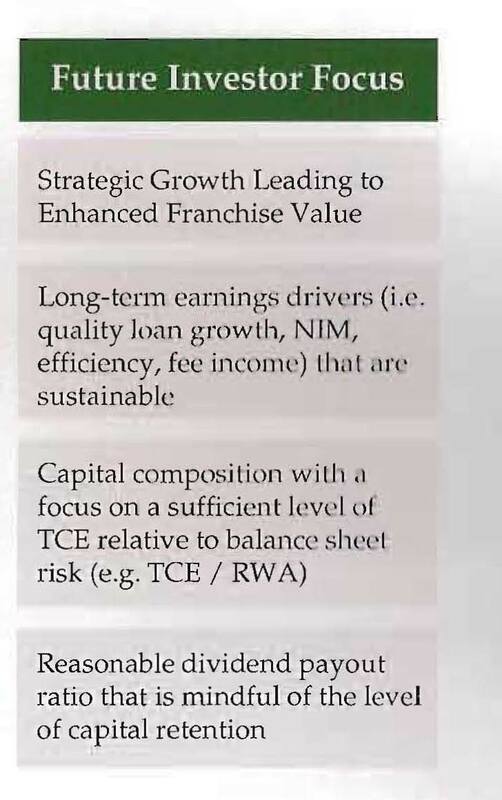 As if the shifting focus of the institutional investor wasn't challenging enough, what about the difference in what retail versus institutional investors value, and how they plan to exit their investment (see table below). Tough luck finding your institutional investor at the local coffee shop bragging that they own stock in your institution. They could care less about how much resources your FI dedicated to the local food bank. 1. 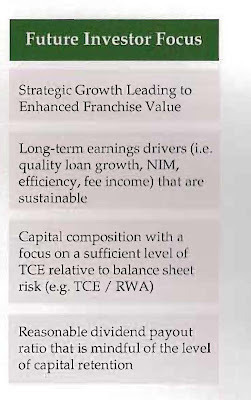 Maximize retained earnings to reduce the need to visit the capital markets. We have gotten a multi-year pass in generating profits because of the financial crisis and the subsequent teetering economy. Now it's time to cowboy up. How productive are your front line employees? How efficient is your back office? How well have you leveraged technology? Have you over-reached with your compliance program? If you don't have the answers, you better start looking for them. 2. Get a real investor relations program. Investor relations is marketing. Marketing is much more than advertising. And your marketing message must be delivered long before you ever need capital. You must spin a story that gets locals excited about your bank. Yes, financial performance will play a significant role, but a supporting role to the story you tell about how your FI is a critical component to local communities. Retail investors may have shifted to investing in mutual funds, but the local community bank is probably one of few chances locals can invest in a company down the street. 3. If you must tap the institutional market, choose your partners carefully. Ms. Schultz specifically addressed this issue in her presentation. Search for institutional investors that share your FIs objectives. Where did this fund invest? How long did it hold the investment? How did it exit? 4. Prepare for the exit strategy from the time of investment. Receiving significant institutional investor dollars does not mean a fait accompli in terms of having to sell your FI so the investor can get out of the stock. However, if you don't plan for the investor's exit when they make their investment, the clock may run out when they are ready to go. Make evaluating strategic alternatives a regular part of your strategic planning, developing financial projections for a stretch case, base case, and stress case. See my post on this subject here. Also, make financial performance, investor relations, and stock trading liquidity a part of your strategy from the git go. If not, you'll find your FI might have up and went. 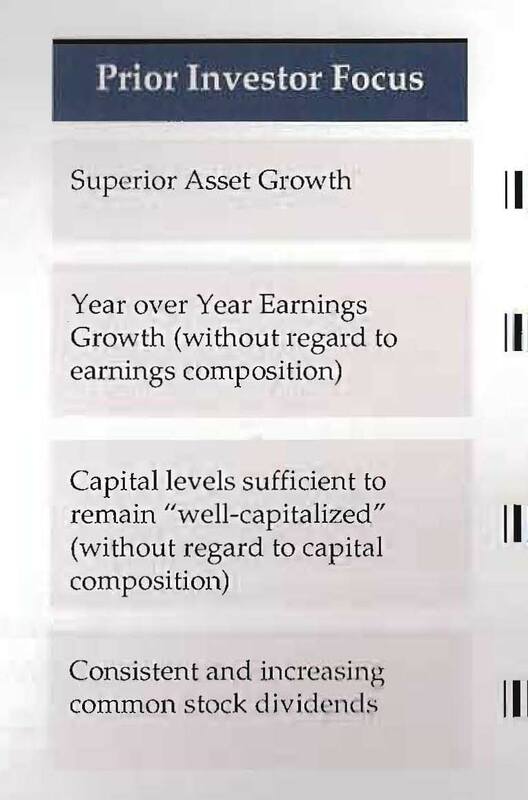 Where will your FI get it's next dollar of capital? I would like to know. Strategy drives structure... in theory only?